Conjunctivitis is an inflammation of the external mucous membrane (conjunctiva) and the most common cause for visiting an ophthalmologist. According to various data, this disorder accounts for 20–30% of all ocular pathology. The occurrence of these disorders depends on the season and the climatic/geographical zone. Conjunctivitis affects children of different ages and its causes are varied. More often there are conjunctivitis cases of bacterial, viral, and allergic genesis. In the past, there were mostly bacterial cases of conjunctivitis (mainly of staphylococcus origin), whereas today there is a trend towards a greater nuber of viral and allergic cases of conjunctivitis. In spite of the great variety of root causes, the clinical picture of conjunctivitis displays a number of common features: reddening and oedema of the conjunctiva with discharges. The disorder often causes a burning pain, itching, feeling of a foreign body ("sand") in the eye, photophobia, watering and eyelid spasms. A cause of the disease is identified on the basis of laboratory analysis results, but this takes a lot of time whereas treatment has to be started as soon as possible. For this reason, treatment often begins with the administration of medications of a wide effective range or on the basis of a possible pathogen (e.g. Chlamydia following a visit to a swimming pool, sauna or a virus during SARS outbreak in a children’s group). Following mitigation of clinical symptoms, it is advisable to repeat laboratory examination since there is the possibility of transition to a chronic form or carriage of pathogen microbes. Over half of patients suffering from inflammatory pathology of the eyes display a proven or assumed viral nature of the disorder. The number of viral affection in this type of pathology is growing annually. The viral conjunctivitis is often accompanied by general reaction of the organism, is long-lasting in nature, and may be complicated by corneal inflammation. The main symptoms are: watering, inconstant itching. There are herpetic and adenoviral conjunctivitis. Herpetic conjunctivitis is usually unilateral, has acute beginning and prolonged and often complicated clinical course. Adenoviral conjunctivitis raises the temperature of the body, swells the lymph nodes and causes inflammation of the pharyngonasal cavity. The main manifestations of conjunctivitis are photophobia, feeling of a foreign body ("sand") in the eye, watering and muco-purulent discharge. Quite often local manifestations of the disease are accompanied with general symptoms of coryza with fever, headache, etc. This diversity of symptoms depends on the pathogen and the state of the child’s health. Often the first symptom is glutinous, non-transparent, grey or yellowish discharges from the eyes which glue the eyelids, particularly in the course of sleep. Bacterial conjunctivitis is highly contagious within groups of children. The role and significance of allergy in ocular pathology is steadily growing due to the fact that according to world statistics over 30% of the population suffer from various forms of allergy diseases. Allergic conjunctivitis lasts over one month and is often of a dual nature. The main symptoms are strong itching, pain in the eyes, oedema of the pupils. Exacerbation of the disease increases the eye itching. During slight improvement periods the patient complaints of the existence of a foreign body in the eye and a feeling of discomfort. In case of conjunctivitis, the patient should not rub the eyes. It is important to follow personal hygiene rules, wash hands, and use a separate towel so as not to pass on the disease to other members of the family. The treatment for conjunctivitis is mainly through local administration: eye drops or special medications. 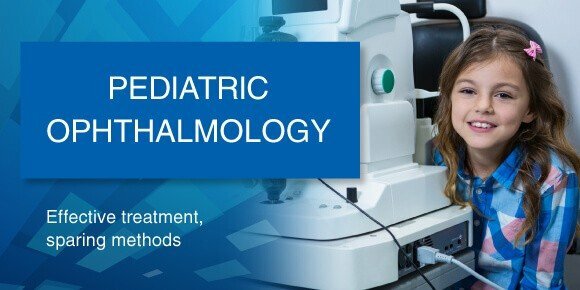 General treatment is rarely practiced and mainly done in the case if the cornea of weakened children is involved in the disorder; but even this is not always the case. Antibiotics are not recommended because the pathogen develops immunity to the drug and the drug may cause allergy. General treatment is applied to combat accompanying general diseases. In case of viral conjunctivitis, general treatment is seldom applied and only in the form of antivirals. Many people erroneously believe that conjunctivitis is a disorder which will disappear by itself. This happens sometimes, particularly with bacterial or viral conjunctivitis. When a child recovers from the flu or an acute respiratory inflammation, conjunctivitis disappears along with the other infections. It is not recommended to cure conjunctivitis of your child by yourself. Be sure to make an appointment with a doctor at a specialized clinic where specialists will offer a correct course of treatment depending on the nature of the disorder and other factors. Medication and integrated local therapy are the most effective forms of treatment. Immune-boosting drugs, polyvitamins, and irrigation of the eyes are also recommended. Besides, it is essential to adhere to personal hygiene. Treatment of allergic conjunctivitis takes a long time and needs the application of local and general medications. Specialists single out a specific therapy for allergic conjunctivitis based on terminating contact with the assumed allergen and boosting resistibility to it. The main disadvantage of this therapy is its duration (months). A non-specific therapy is performed in cases when the allergen has not been identified. It is done on a course basis and the effect is achieved two weeks after the beginning of the treatment. Quite often additional methods of diagnostics and consultations with allergists are required. The spread of conjunctivitis, its high contagious degree requires timely identification of the disorder, correct treatment and measures to stop its progression. Immediately after the first symptoms of conjunctivitis are noticed in one eye of the child, the parents shall take measures to prevent the disorder from affecting the other eye and safeguarding the other members of the family. The child should not join any group of children and be shown to an ophthalmologist as early as possible.